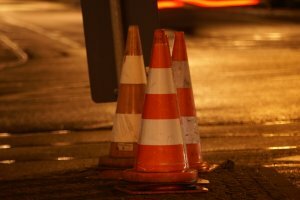 As you will be aware Forkers are currently working in phase 2 of maintenance work to the A5 Towcester High Street on behalf of Highways England. A road closure is currently in place from the Northampton / Brackley Road junction down to Richmond Road. The concrete to the new slab over the gas trench in Phases 2a and 2b (part), which will be poured this week, requires several days to cure and during that time no other work can be carried out in those Phases. 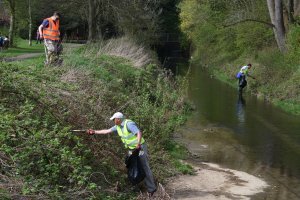 In order to prevent any delay to the scheme, Forkers will install three road gullies in a short section of Phase 3 whilst the concrete cures. 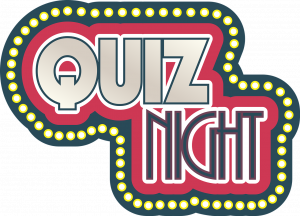 Charity Quiz Night at the Town Hall on Saturday, 22nd September 2018 at 7:00 p.m. for a prompt start at 7:30 p.m.
Bring your own drinks and nibbles and come clued up for a great evening. Please see the attached detailed update of the roadworks in the town centre. Subject to staying on schedule, the works are expected to move onto phase 3 on Monday 24th September. Towcester is open for business as usual during these essential works and all of the public car parks are accessible so please use your local shops, bars and restaurants and ask others to do the same. We have been advised that Forkers will be carrying out works to reline approximately 64 metres of an existing 225mm diameter sewer, running south from Reffield Close towards Marlow Road on Friday 7th September 2018. 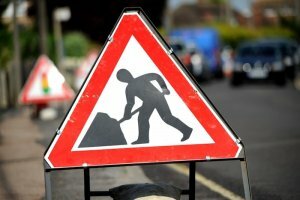 We have been advised that Clancy Docwra will be carrying out works, on behalf of Anglian Water, to replace a water main in Northampton Road near the junction of the southbound A5. This work, which was originally started but suspended in June 2018, will start on Monday 3rd September 2018 and is expected to take one week to complete. Please find attached a letter from Highways England about emergency overnight works on the A43 between M1J15A and Tove roundabout, to carry out alterations to the temporary closures of the gaps in the central reservation. 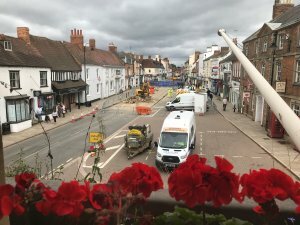 Here are extracts from the latest update from Forkers who are carrying out the roadworks in Towcester High Street. See the attached documents for the full update, road closures and temporary traffic systems. 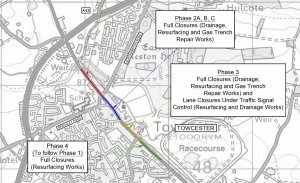 "We have completed works to Phase 1 and substantially completed works to Phase 4 of our essential maintenance scheme on the A5 in Towcester." 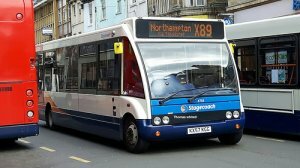 Buses will be unable to serve stops on A5 between Northampton Rd and Marlow Rd in Towcester, including Towcester Square. Passengers are advised to catch their bus at stops located behind Saracens Head Hotel. XHTML 1.0 validated. WCAG compliant. Page generated in 0.0803 seconds.